"You can just tell people you got into a bar room brawl." Sure, that will alleviate any suspicions by strangers that the numerous lacerations, abrasions, and stitches in my face and limbs are from spousal abuse! That's a fear Jim and I both have and one of several reasons I'll be keeping a very low profile until some serious healing has occurred. The real story is much better. Or, it would be if I could remember what happened!!!! That's the nature of a head trauma, specifically a concussion: post-traumatic amnesia. It's one of several new medical terms I've learned this week. This is different than CRS (Can't Remember Stuff), although I would characterize both of them as being types of subconscious or unconscious selective memory loss. I should cut to the chase here and do the Drama Queen bit later . 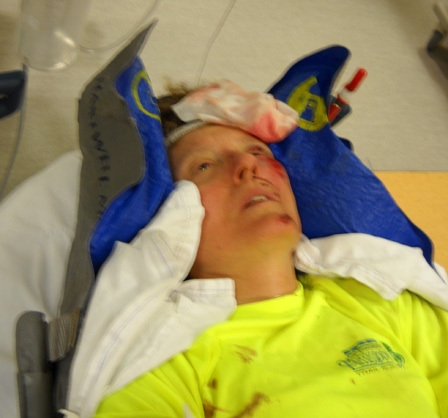 . .
Long story short, on Monday, August 3, near Silverton, Colorado, I had a serious bicycling accident which no one apparently witnessed. My own memory of the event is completely blank from right before the wreck, the impact, and the next 25-30 minutes afterwards. I look and feel like a semi truck hit me but I don't think another vehicle was involved. My injuries and collateral damage are moderately serious -- brain concussion, one or more cracked/broken ribs, multiple lacerations and abrasions, plenty of initial bleeding and continued oozing three days later, sore places all over my body, lost helmet, destroyed glasses, damaged bike -- but it could have been much MORE serious. For example, I could have gone off the right side of the road on the bike, bounced down the rocky 40-50 foot cliff several feet away from where my blood still stains the road, and landed in the creek below. If that had happened, I'd probably either be dead or wished I was. Take a look at this photo, which I took at the scene the next morning. Jim is standing near the blood stains where I was found. Notice how close I was to the edge and how far down it is to the bottom. Jim is almost six feet tall, and is dwarfed by the rocky slope. It's not as smooth as it looks, either. Jim was promptly notified and beat the local rescue squad to the scene. He followed the ambulance to Mercy Regional Medical Center in Durango, CO, where I was assessed and treated promptly and professionally by the trauma team in the ER. They observed me for about four hours before releasing me to lick my wounds in private. I'm still sore and look like hell, but I'm alive and most grateful for that. This has been as traumatic for Jim as for me, and I'm really sorry about that. I'm fortunate to have a hubby with as much EMT training as he has. You can't imagine how useful those skills can be for family members and friends, as well as the strangers he rescues. If you're ever injured in an accident, one of the first people you want assessing the damage is someone who has emergency skills and knows how to keep you safe until the ambulance arrives. I was very lucky that he was one of the first people on the scene, even though he was back at our camper when the incident happened. The rest of this saga will be lengthy and will probably come in four or five parts. You've been forewarned -- but I think it will be interesting, educational, and intriguing enough for you to read each part. This is the first time in my 60 years that I've been in an ambulance or have gone to the ER for my own emergency. It's also the first time I have experienced most of these injuries or amnesia. Amnesia is spooky. Maybe some of the information will be helpful for others, like what I did right and what I did wrong on this bike ride. Some things apply to any foray into the outdoors. I've always been willing in this journal to serve as an example not only of what works for me but also sometimes what not to do, because it might serve as a cautionary tale for others. I've learned a lot about head trauma, concussions, amnesia, rib fractures, and wound care; I'll share some of that, as well as information about my recovery. I'll also spend some time on the things that have us both completely baffled, such as what caused the violent crash, the location and juxtaposition of my injuries, and the totally weird damage to the mountain bike. Since we don't have a detective or forensic scientist to help us unravel all the anomalies, describing them might bring forth some clues from readers. Writing out my thoughts is also part of my way to make sense of it all. It's therapeutic for me. Besides, it's hard for me to focus on anything else right now. My life currently revolves around healing from this trauma to my mind and body. You're used to me filling these journal pages with mostly shots of beautiful mountain scenery. I'll have a few of those in the next few entries but I'll also include some that can best be described as "gross." Don't read this when you're eating your lunch! I'll start you off easy in this first entry. Jim started snapping photos on the way to the hospital but I didn't know that until I downloaded them onto my computer the next day. I had to laugh in amusement when he started taking pictures of me in the ER. I encouraged him to continue taking them. I've either trained him to document life's moments better than I thought, or he was getting revenge for all the pictures I've taken of him! My camera was in a pouch on the belt of my fanny pack, which I gave him as I was getting into the ambulance. I don't remember anything until that point after the crash, but I had enough presence of mind to be concerned about the safety of the camera and I knew my ID and insurance cards were in the fanny pack. I'm vain enough about my looks that I initially didn't think I'd post any photos here that show my facial lacerations. I've changed my mind. I don't want to freak anyone out, especially my family, but the ugly road rash is a major part of the story and my recovery, which I'll write more about as time elapses. The new pictures of me in this entry and the next ones depict the "during" (injured) phase. I hope to have nice "after" (recovery) photos to share eventually. I can pretty well guarantee they won't involve either plastic surgery or PhotoShop editing. I like to be honest and I'm too frugal to put some dermatologist's kid through college. Monday was a rest day for the two of us. On Sunday we'd done rather short (8-10 miles) but strenuous runs on dirt County Rd. 110 from Silverton toward the old mining town of Gladstone. 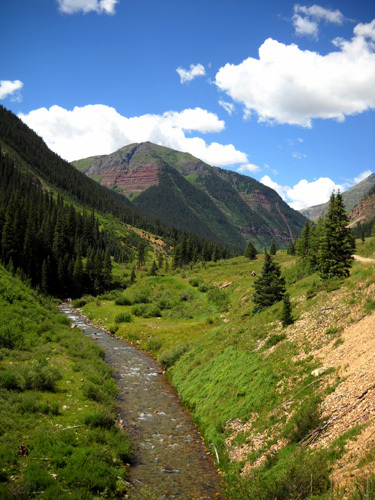 Like most of our runs in the San Juan Mountains, it was at high altitude (from 9,300 to 10,200 feet) and we needed a day or two to recover before our next long run/hike on trails. Jim spent time doing miscellaneous tasks around the camper, played with Cody in the creek, talked to one of our campground neighbors (Frank) who runs ultras, talked to another guy who has been full-time RVing for thirteen years, and got further psyched up for The Bear 100 race in late September (which he just entered over the weekend) by reading past reports, investigating camping options, and working on his split charts. I had been inside too much that day. After several hours of mostly working at my computer, I needed to get outside, do some moderate exercise, and "open my horizons" visually and mentally. Most of the day had been cloudy but no appreciable rain had fallen -- not enough to hold down the dust on South Mineral Creek Road, at least. It's very convenient to head out our camper door and get on this road during the truncated four weeks we've camped at this "dispersed" (free national forest) campground this summer. However, we've both hesitated to either run or ride our bike much on this road because of the traffic and dust. We much prefer trails for running/hiking; neither of us rides Jim's mountain bike a lot. It's handy for some cross-training, but our passion is more "pedestrian" (pun intended)..
We've noticed that traffic is lighter the first two or three days of the week -- fewer Jeeps, ATVs, dirt bikes, motorcycles, trucks, cars, and RVs driving up and down the road. I hadn't seen much traffic Monday so when our valley was finally under bright sunshine at 4PM, I asked Jim to pump up the bike tires for me and fix the gears/chain that malfunctioned on me Sunday when I tried to ride it on the road to the old mining town of Gladstone. After we both tested the bike nearby and felt that it was in good working order, I headed off alone for a short, fairly easy ride. Well, fairly easy for a more experienced rider. 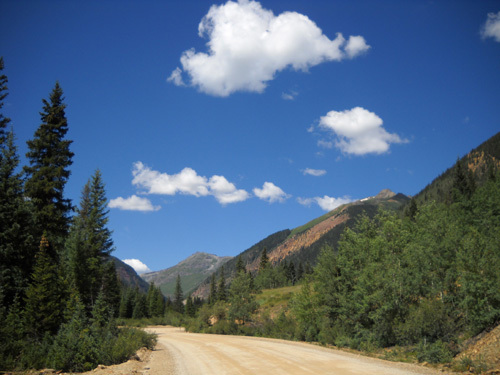 After being at high altitude all summer I'm acclimated to the elevations around Silverton for hiking and running, but my cycling legs aren't as strong. Nor are my bike skills. I just don't cycle that much any more and I don't like Jim's old bike very well. It wasn't built to fit me like my Terry road bike. (We don't have it on this trip. It's for use on pavement only and we didn't think there would be enough opportunities to ride it safely on this trip.). 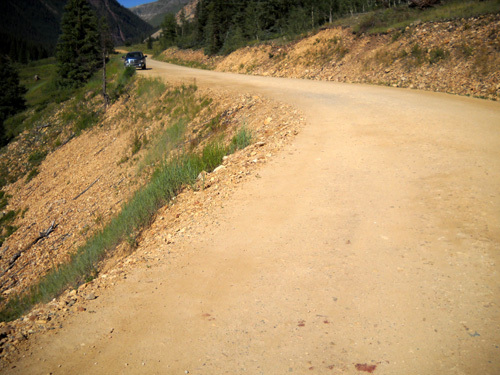 The smoother part of S. Mineral Creek Road that I ride rises from about 9,400 - 9,900 feet elevation in 4+ miles from Hwy. 550, past our campground, and to the trailhead parking area for the Ice Lake Trail. That's not exactly steep but it's enough of an uphill grade that I have to pedal much harder outbound than on the return. The road continues on another three miles or so, but that part is so rocky and narrow I haven't even considered riding on it; it's a challenge for a clumsy person like me to run.. I do recognize SOME of my limits! 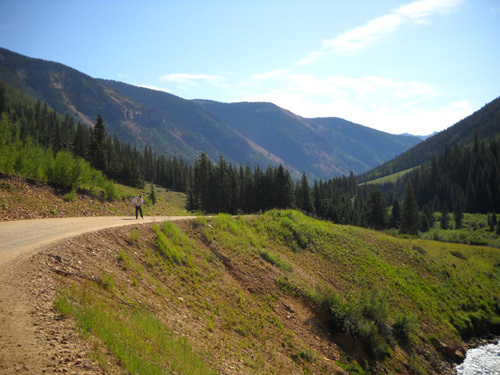 My goal on Monday afternoon was to ride nine miles total on the "good" part of the dirt road at a comfortable pace, loosen up my running legs for a long run/hike on Tuesday, and enjoy the warm sunshine ("warm" is relative in the San Juan Mountains: low 70s at this elevation). I told Jim I'd be back in about 30 minutes. I seriously underestimated how much time it would take me to do this ride at a "comfortable" pace. Not that I was in any hurry to get back to the camper after the turnaround -- I knew it would take half as long as going out -- but I was conscious of my mistake and hoped Jim wasn't worried about me. Let me tell you, nothing worries a loved one like getting an urgent cell phone call from a complete stranger that your spouse or other family member has been in an accident and an ambulance is on its way! 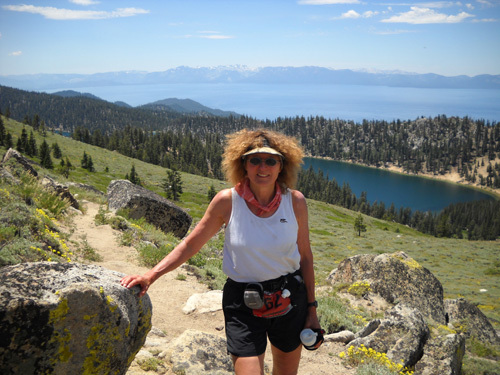 My memory of events up until about a minute before I crashed were completely intact when I was being questioned and evaluated in the ambulance by Dave, the EMT attending to me on the 65-mile drive over two mountain passes to the nearest hospital. My memory of the bike ride up until then is still intact three days later. I remember exactly when I started my ride and when I left the turnaround (4:58 PM). 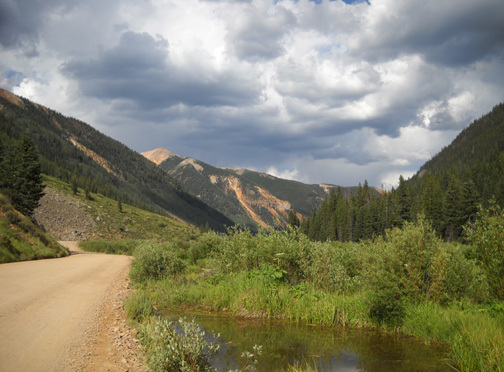 I remember the beautiful view of a colorful mountain on the way back and the gray storm clouds gathering behind it; I wondered if I was going to get wet soon. I carefully stopped off the side of the road to take a picture of it (below) and to return the camera securely to its padded case. The sky behind and over me was brilliant blue, studded with puffy white clouds. It was a great day to ride! I remember there were fewer vehicles on the return than going outbound, and I was grateful for less dust in my eyes, throat, and lungs. I remember passing the campground where we stayed in 2006 and 2007, noting how much emptier it was than the more popular spot we've used this summer. I remember passing a black truck along the side of the road; the driver was on her cell phone and I thought how novel (and more safe) it was to pull over to talk. The last thing I remember before crashing was the feeling of flying effortlessly down the road, mostly coasting, with my hands pressing both brakes lightly. Gravity was pulling me down the mostly gradual slope for four miles and I didn't have to work hard at all. The gears and brakes were working fine on the simple, old bike. I felt like I was floating through the air. I'd guess my speed was at least 20MPH, but we don't have a speedometer on this bike so I could have been going faster. I know I've gone a lot faster over the years on road bikes on paved roads. Maybe I was just plain lucky I never wiped out before. What I'm relating now is based on information from Jim, the Swansons, and a nearby camper (Rick) who came up to the road from his campsite to see what all the commotion was about. I have no memory of this. I talked with the Swansons by phone and with Rick in person on Tuesday morning, about 16 hours after the accident. Jim had talked with all of them when he arrived on scene. I crashed the bike 10-15 minutes after leaving the turn-around at the end of the road, which would make it about 5:08-5:13 PM on Monday. Although no one apparently saw me go down, it took only a few minutes for someone to find me since I was blocking the narrow road. If I'd gone down the hill to the creek, it probably would have taken much longer for someone to find me. Jim's phone rang at 5:21 PM. 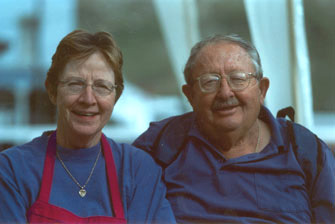 It was Nancy Swanson, who owns the Villa Dallavalle B&B in Silverton with her husband Gerald. The Swansons were driving by when they saw me sitting in the road, three or four feet from the edge (right above the rock slide to the creek), with the bike lying on its side about a foot away from me. I was near the blood spots that you can see in the next photo. I don't know if I moved myself into that position or if I sat there, stunned, right where I landed. I still had my helmet on. My glasses and sunglasses were lying in the road. I was dazed and disoriented and the Swansons could see blood on my face, arms, legs, and clothing. I didn't see any blood till I got to the hospital. Another woman got there "about the same time," according to Nancy, coming from the other direction. Apparently she just freaked out when she saw me and was totally useless. I don't know if she's generally useless in an emergency, if she was in a hurry and was frustrated that she couldn't proceed with me blocking the road, or if she maybe almost ran over me coming around the blind curve in the other direction (you can see it in the first photo in this entry. Yikes!! I'm glad no one ran over me! Few people drive the speed limit on this road (20-25 MPH) and I was very vulnerable to someone who might have been speeding or not very alert on the curves, particularly the blind one to the east. What was left of my blood spots (foreground) 16-17 hours later; this view looks west. Nancy and Gerald got out and came over to me. When they saw the blood stains in the road next to me, and my blood-soaked white cotton headband, Nancy suggested I take off my helmet so they could inspect my head further. They said I took it off and let them check me out. Jim, who is EMT-trained, says this wasn't good post-wreck protocol, but the average person doesn't realize the potential dangers of permanent damage to a victim with head or spinal injuries. I sincerely appreciate what the Swansons did to assess my condition. Seeing the bad gash on my forehead more clearly prompted Nancy to immediately call 911, which was good protocol, and she and Gerald knew not to try to move me out of the road -- another very good decision, even though it backed up traffic in both directions for a while. Meanwhile, Rick came up several hundred feet from his tent farther down the creek. His wife told him about the commotion up on the road and he came up to investigate. He also sounds like a sensible person to have around in an emergency. Either Rick or Nancy questioned me about an emergency contact. Although I had that information on a card in my fanny pack, they didn't know that. Nancy said I clearly told her Jim's name and phone number. (I didn't take my phone because there is no cell signal down the road from our campground.) I do not remember doing that, but it shows that at least one part of my brain was taking care of business. This "layers of consciousness" thing totally fascinates me! I've discovered I answered other questions accurately at the scene that I don't remember, either. Jim left the camper pretty quickly after receiving Nancy's urgent phone call. He grabbed his EMS bag, put Cody into the camper, locked the door, and tore off for the 1�-mile drive up South Mineral Creek Road to the accident scene, arriving four or five minutes after getting the call. He followed the Sheriff. They both beat the Rescue Squad by five or six minutes. Several vehicles were parked along the road when Jim got there and more got backed up before the scene was cleared. Jim said he was there only about ten minutes before I was whisked away by the ambulance. I do not remember hearing or seeing any vehicles or people around me, only Jim. Talking to Rick in person, talking to Nancy and Gerald on the phone, and seeing photos of the Swansons on their website has done nothing (yet, at least) to restore those memories. I am very appreciate of all that these and possibly some other folks did to get professional help to me quickly and to make things easier on Jim. It's got to be very difficult on several levels to be the first, or one of the first, people on the scene of an accident. I'm glad they kept their cool and took appropriate steps. No one had moved me before Jim arrived. As mentioned, that was good in my case. He did his standard EMS check for head and spinal injuries, then determined it was appropriate to have me lie back on the road so I'd be more comfortable and ready for the stretcher. I don't remember him doing this, or even being there on the road. When the EMTs from Silverton arrived they questioned Jim and me, then did their own "rapid assessment" of my condition before loading me into the ambulance. I don't remember them checking me over or questioning me, but I apparently answered their questions fairly well -- except the part about "what happened?" I may never be able to answer that one. My first conscious memory after the wreck was seeing Jim's familiar face as he was helping the EMTs lift me onto the stretcher. I still didn't know where I was or what had happened but I remember seeing his face (and only his face, no one else's) and telling him that I had my insurance card in my fanny pack. He helped me get it out and put it in the waistband of my bike shorts in case he didn't arrive at the hospital as soon as I did. I don't remember any other questions, conversations, people, or vehicles until after I was loaded into the ambulance. Oddly enough, I do remember thinking how pretty the blue sky and white clouds were as I laid on the stretcher before they lifted me up into the ambulance. The gray clouds were farther east and I couldn't see them any more. Isn't it interesting the things that were significant enough for me to remember, even when I was in shock? Jim's face, the infinite blue sky, my insurance card . . . how practical and how sublime. NOT THE TYPE OF ADVENTURE I SEEK! Another one of the odd things I clearly remember as I was coming out of my daze was the excitement I felt, not of being rescued, but of riding in the back of an ambulance! At the time it seemed like just another grand adventure. Wow. I assure you this says more about my altered level of consciousness at the moment than about the fully-conscious attitude I have about first responders, trauma teams, and going to an emergency room. Yes, I've had good experiences with the ER when I've been there with others but I've always hoped to avoid needing one for myself. That is not what I consider to be an adventure. Calling 911 is serious business and should not be done frivolously. I know from Jim's experiences with his rescue squad in Virginia that too many people take the service for granted and make unnecessary calls for transport to the hospital. Some of them may see it as an adventure. They need to get a life. I only mention this strange memory to illustrate how the mind can react when it's still in shock. I definitely needed to go to the hospital and I'm grateful Silverton EMS arrived so quickly on scene. There I go! 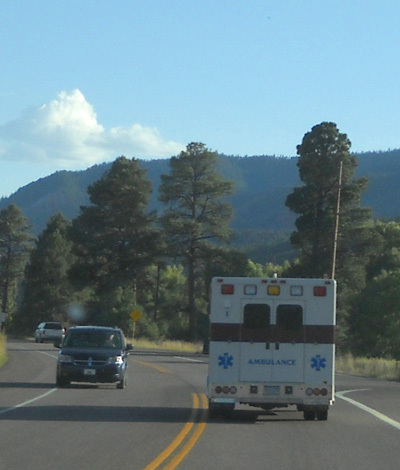 Jim took this windshield shot as he followed the ambulance to Durango. Jim was in a bit of a frenzy as the ambulance was preparing to leave. Rick and the other bystanders quickly handed him the bike I'd just mangled, my equally-mangled eyeglasses and perfectly fine sunglasses (must've popped off before my faceplant), the cracked rear-view mirror that broke off my helmet, and a blood-soaked towel someone must have given me or used to wipe me off. There were just two EMTs and one had to drive the ambulance. Dave stayed in the back with me; we haven't learned his last name yet. Jim followed closely in the truck, knowing he (hopefully, we) would need transportation back to Silverton that night. From South Mineral Creek Road west of Silverton we had a long way (about 65 miles) to go south on Hwy 550 through the mountains and over two passes to get to the hospital several miles beyond downtown Durango. Because my condition appeared to be fairly stable, the ambulance didn't run with lights and sirens. Jim was amazed how many people pulled over for us without the lights flashing. And despite not using Opticon to keep the lights green for our passage through Durango, I don't think we stopped more than once or twice for red lights. We missed rush hour and the road work in town, arriving at the hospital a little after 7 PM. Inflated cast for head/spinal injuries to keep the head and torso immobile. I clearly remember the trip to the hospital, which took at least 90 minutes, although the gentle vibration from the road and not being able to see where I was going almost lulled me to sleep after a while. That did not make me nauseous, fortunately. Jim's used to people throwing up frequently in the back of the ambulance while in transport. I wanted to wriggle around more than the head cast would allow, so I was glad when it came off in the ER and I could change positions a little bit. Dave-the-EMT kept me alert and amused the entire way to the ER. Thank you, Dave! He asked all kinds of past and present questions to ascertain my level of consciousness; gave me three words to remember when he asked me for them 20 minutes later (I remembered them correctly); took a blood sample so the hospital could run pertinent tests; monitored my vital signs (heart rate, blood pressure, and 02 stats); and gave me supplemental oxygen even though my rate was satisfactory "just in case you need it." (I later learned that's pretty standard for folks who have just received head injuries.) 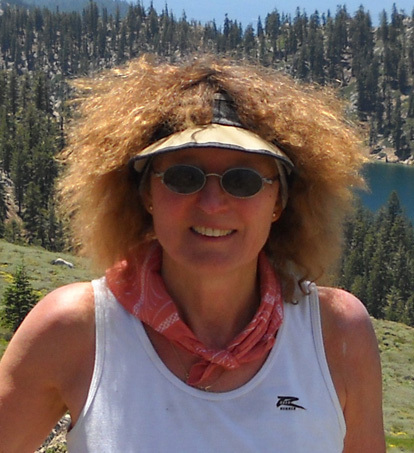 We talked about my injuries, the local area, running and other sports, Dave's job, and a mutual friend from Silverton who used to work with the rescue squad before her recent move to Moab (Hardrock volunteer and aid station coordinator, Lois MacKenzie). Although it was a long ride, I was pretty comfortable, in no pain (the shock hadn't worn off yet), alert, aware of everything going on around me, able to ask and answer questions, and capable of carrying on rational conversation. "Normal." But for the life of me, I had no awareness of what happened right before, during, or after the wreck! I knew that I had been injured in a bike crash because that's what I was told, but I could answer no questions about it. Three days later, I still can't. 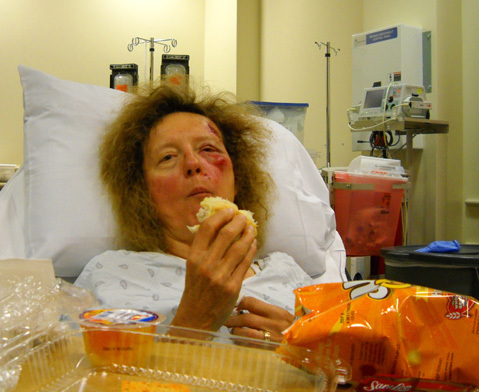 This was the first time I'd been in an emergency room as a patient receiving care. I've been to one in Sheridan, WY with Jim after his rattlesnake bite and with my ex in Atlanta after a suspected heart attack (fortunately, just a bad case of indigestion). Both were relatively quiet experiences with caring, efficient professional staff., not the negative depiction you sometimes see on TV, in movies, and in print media as loud, frenetic, crowded places to sit and wait in agony for hours until a cursory exam with a doctor or nurse. 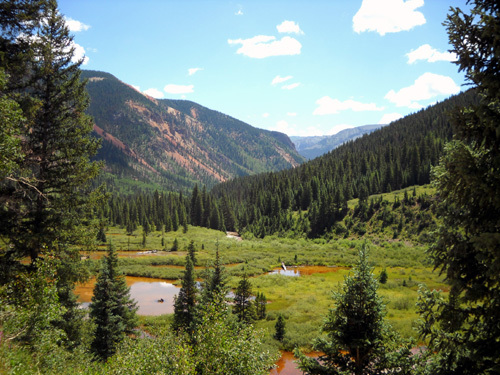 Since my previous experiences were fairly positive, I was in a good frame of mind when I finally arrived at the Mercy Regional Medical Center in Durango. After all, I was still in some level of shock that masked all the bad stuff. I still had on all of my clothes, including my blood-soaked sweatband and neon-yellow shirt and my bike shoes and gloves. I hadn't seen any blood or felt any pain yet. Jim was amazed that I wasn't crying or complaining of the pain when he saw me. I didn't really start to hurt until several hours after the crash. I had no clue as to the severity of my injuries or I might have been more worried! Thank goodness for ignorance and endorphins/adrenaline (shock) at that point. Jim was able to follow the ambulance closely the entire way, so he was right there in the ER with me as they rolled me into a room by myself. He handled the insurance part in my room (not a desk down the hall) and the only administrative thing I had to do was sign a form before my release. Jim was able to remain with me for everything (including two visits to the bathroom) except the 15-20 minutes in a nearby room for two CT scans. Mercy has somewhat recently moved from the north end of Durango to a rural location SE of town -- all that much farther from Silverton. I was lying on a stretcher in my "own" spacious room (above) the whole four hours I was there except for the scans. 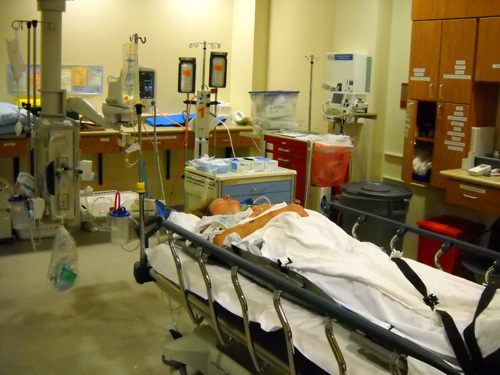 Several other trauma center rooms around the central nurses' station had patients but I never felt any frenzy going on and I wasn't moved to allow someone else to use "my" room. My timing was good. I was given a saline IV soon after I entered the ER. It went with me to the scanning room and bathroom. That was a great idea, considering I'm usually dehydrated to some extent. I was also hooked up to a blood pressure cuff on one arm and clothespin-type sensor (Pulse-Ox?) on one of my forefingers that continuously measured my heart rate and oxygen level. 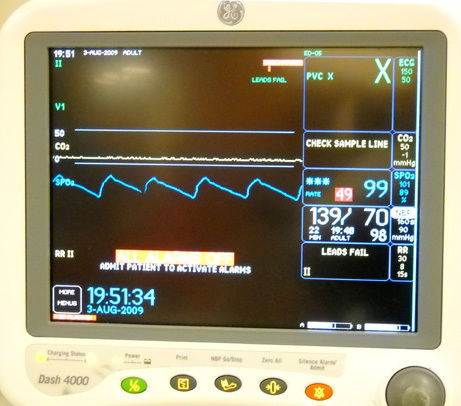 Both the cuff and sensor displayed my vital signs on a monitor over my stretcher. You'd think the lower the HR the better, but my 44-49 pulse rate in the ER caused the monitor to constantly beep. The number 49 is red in the photo below because my HR is "below normal." I knew to tell the EMTs and ER staff that I've been running for 30 years, so they understood the low numbers but didn't adjust the monitor. The noise got so annoying after three hours that I just took the sensor off. No one seemed to notice. My blood pressure was higher than normal but evidently not a concern to anyone but me. My O2 level remained high enough (the blue 99 below, when 95-100 is ideal) that I didn't need any more supplemental oxygen at the hospital. It's a good sign that, after being slammed around in the skull, my brain was getting enough oxygen. I think I'm pretty well acclimated up to 13,000 feet right now, so Durango's altitude of about 6,525 feet seemed positively saturated with oxygen. The ER staff, including Dr. Mapes, attended to me quickly to assess the damage. 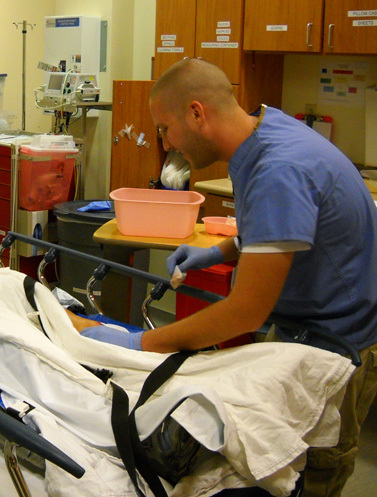 Injuries to the head and spine are some of the most critical emergencies that trauma centers face. Medical personnel always suspect spinal damage when there is a head injury. Because my head and face took the brunt of the fall, at a fairly high rate of speed no less, they wanted to see how much brain and cervical spinal trauma I sustained. I answered lots more questions (except about that period of time that remains a blank); they could see I was alert and "in the present" but didn't know how badly I was injured inside. While I was still in the inflatable "cast" and unable to voluntarily move my head or shoulders, the doctor assessed my spine and movements of my arms, fingers, and legs. Jim was surprised that no one ever took my stiff bike shoes off to see toe movement, but I know I could move my toes OK.
Dr. Mapes also determined upon palpitation (ouch! the first pain I felt) that I had one or more cracked or fractured ribs. No X-rays were taken of my chest, however (more about that in the next entry). Someone wanted to cut off my bloody, bright yellow synthetic shirt from the MS50 race and I bargained with them: get me out of this contraption and I'll take it off the proper way, over my head! That was out of the question until after the spinal and brain CT (computerized tomography) scans, but they did leave it on me until getting the positive results from the scans. Once freed from the cast, I could sit up and move my arms enough to remove the shirt with assistance. They even gave me a spare t-shirt to wear over my sports bra on the way home. I tossed away the bloody sweatband but kept the bloody MS50 shirt. It's a great shirt to use on roads when I need visibility to avoid being hit by a vehicle. I've experienced a lot of firsts with this wreck. This was also the first time I've gotten CT scans. I was pleasantly surprised at how fast and quiet they were, compared to MRIs. It took less than an hour for the scans, the radiologist's findings, and reassurance from the attending ER physician, Dr. Mapes, that the results were fairly good, considering the significant impact my head appears to have sustained. The head CT scan showed no acute brain abnormality or fractures of the skull or face. It showed "left frontal scalp hematoma [collection of blood in soft tissue] and laceration [cut]; left malar [cheek] soft tissue swelling; mild radiopaque debris in left frontal scalp soft tissue." Fortunately, those injuries were all outside the brain and skull. The cervical spine CT scan showed "no acute fracture or caseous abnormality; multilevel degenerative changes." It wasn't until I read the summary on the way home that I found three areas of concern that I need to follow up: severe degenerative disc disease and uncovertebral joint hypertrophy at C6-C7, severe multilevel facet hypertrophy on the left side, and heterogeneous enlargement of the thyroid gland. Hmmm . . . didn't know about any of that. Since my lacerations and abrasions were doing more oozing than bleeding (no major vessels were cut), it took longer for the staff to get around to cleaning them and stitching me up. That wasn't as high a priority as determining the status of my brain, spine, heart, and rib cage. By the time I left, each wound on my face, arms, and legs had been assessed, debrided, treated with antiobiotic cream, and bandaged. Dr. Mapes put multiple stitches in the deepest laceration (on my forehead) and one stitch in a cut in my eyelid after the nurse irrigated the eye with a saline wash to remove some grit that irritated it. I'll write more about the wound care I received in the next entry. I'll show more photos from the ER in the next entry. Don't worry; I'm not putting the worst ones in this journal. At some point before the shock hormones began wearing off, and long after my last dose of Ibuprofen in the middle of the afternoon had faded, one of the ER staff asked me to rate my perceived pain on a scale of 1 to 10. I quickly ran through a mental check of all my body parts and came up with "7." That was difficult, though. I think I tolerate pain better than the average person does, but how do you quantify tt? All I could do was compare it to other pain I've felt, and it wasn't intolerable. Maybe I should have given a higher number, because I wasn't able to talk the doctor into letting me have some NSAIDs until I started hurting quite a bit more a couple hours later. Then they were either too busy or didn't seem to believe me. We arrived at the ER about 7:20 PM Monday. I'd say by 9:30 PM most of the shock and endorphins had worn off and the fun factor had significantly decreased. Pretty much all at once I was starting to feel noticeable pain, hunger, and the need to urinate. My bathroom needs were addressed pretty quickly. Jim and a nurse helped me to sit up slowly so I didn't hurt my rib cage or get dizzy. I was able to walk with one or both of them supporting me down the hall about 100 feet to the bathroom. Jim went in with me to be sure I didn't slip or faint. I did fine then (with assistance) and on one other trip to pee. I deliberately avoided looking at my face in the bathroom mirror the first trip. Ignorance is bliss. By that time I had seen my bloody sweatband and shirt, and had a better grip on my injuries since I could see my arms and legs after being allowed to sit up. But I wasn't ready to look at my face quite yet. I could feel the abrasion under my left eye but not the more serious laceration on my forehead. I did take a peek at my face the second time in the bathroom. I was almost as concerned about my bloody and matted "helmet hair" as the lacerations and abrasions! What a frightful mess. I asked Jim to go out to the truck and get my hair "pick" so I could comb it. On those two walks down the hall I noticed that my left calf was awfully sore, and mentioned it to the doctor on my return. So was my left shoulder, the one for which I've been doing rotator cuff therapy. Just one piece of bad news after another! Dr. Mapes noted them as "calf and shoulder strain." Can't wait to see what I look like when all the bruises appear . . . It took a while longer to get someone to being me an NSAID and something to eat. I even suggested they put pain meds and calories in the IV tube that was sending the saline solution into me, but that didn't happen. No one gave me any food choices. I was surprised at the poor nutritional quality of the meal they brought me: a tasty but fat-laden croissant filled with turkey breast, a bag of SunChips, a gooey chocolate brownie, and a cup of chilled canned fruit. Only the fruit appealed to me that night. I forced down half the sandwich (next photo) and encouraged Jim to eat everything else. He was hungrier than I was. The 400 mg of Motrin didn't begin to touch the pain I was feeling by the time I got it about 10 PM, so about an hour later I asked for one of the four generic Percocet (Oxycodone + acetaminophen) tablets the doctor was sending home with me. I am very sensitive to any narcotic-type drugs, even synthetic ones, and didn't want to take the doggone thing but I must say, it alleviated all or most of my pain. In fact, I was back in my happy daze all the way home! Unfortunately, I regretted taking the generic Percocet about six hours later when I woke up to nausea (didn't barf), the sensation of blinding lights, dizziness to the point of being unable to walk fifteen feet to the bathroom, and blacking out temporarily. I was sweating profusely, then very chilled. Lying down was painful, so I slept fitfully for another hour on the couch in a slouched position that was tolerable to my cracked ribs. That was the last I took any of the narcotic pills. Of course, all those symptoms could have been from the concussion, but further investigation points to the Perc as the culprit since I've had problems with such drugs previously. Ibuprofen is my painkiller of choice for osteoarthritis and running aches and pains, and it's done a good job of reducing my level of pain the last two days. I don't need opiates for this accident, although I realize I probably will when I get my knees replaced someday. I was hoping my injuries weren't so serious that I would have to spend the night (or longer) in the hospital, especially since we are staying so far from it. Jim would have had to return to Silverton to take care of Cody, then drive all the way back down to Durango the next day. Fortunately, I got to go home after about four hours of testing, treatment, and observation. Whew! When I was released from the ER about 11:15 PM, I was given some verbal (no written) wound care instructions, written results of the two CT scans and blood work, two types of antibiotic creams (one for my eye and and one for my wounds), three more generic Percocet tablets for pain, and a prescription if I need more. The nurse and doctor answered all the questions we had throughout our stay in the ER and advised me to have the stitches removed in five days. Since we plan to be in Silverton until Sunday or Monday, we'll go back down to Durango on Friday afternoon when Dr. Mapes is working. Follow-up is already factored into my bill and there are no medical facilities or doctors in Silverton. We stopped at the Durango WalMart near the hospital on the way home so we could get more bandages, tape, and triple antibiotic cream. Jim also has some supplies in his EMS bag. There is no pharmacy or WalMart in Silverton, so if I need anything else before Friday, I'm either SOL or we have to drive to Ouray (25 miles) to the nearest drugstore. On the way back to Silverton through the mountains Jim drove under the speed limit and deftly dodged at least fifteen deer that were browsing right next to Hwy. 550. Most stayed put but a few just had to cross the road in front of us. After hearing a thump, Jim thinks he clipped the rear foot of one, although he couldn't see it limping. We were prepared for the deer after a friend of ours said he'd spotted about the same number late one night as he was driving back to Silverton. I was relieved that my brain-eye coordination was good enough to spot a few of the deer before Jim did, even after falling on my head seven hours earlier! My official diagnosis includes brain concussion, one or more rib fractures, facial lacerations, multiple abrasions on my face, arms, and legs, plus shoulder and calf strain. I'm experiencing a lot of firsts. This is my first concussion , amnesia, rib fracture, significant facial injuries, and so many deep abrasions and lacerations at once -- and hopefully my last. As such, it's my turn to ask questions -- lots of questions. Some were answered in the ER, some by Dr. Mapes when I talked to him on the phone today, some on the internet, and some from reading one of Jim's thick emergency medical training books that he brought with us. I'm sure I'll have lots more questions to ask the ER staff when I go back in on Friday to have the stitches removed. Jim and I both think we should have been armed with more verbal and written instructions when we left, particularly about wound care, but they may have assumed Jim-the-EMT would have all the answers. He readily admits he doesn't but he's been a great caretaker and his knowledge of emergency care has been a source of comfort to me. And we soon learned that his methods of wound care worked better for me than the instructions the nurse gave us. 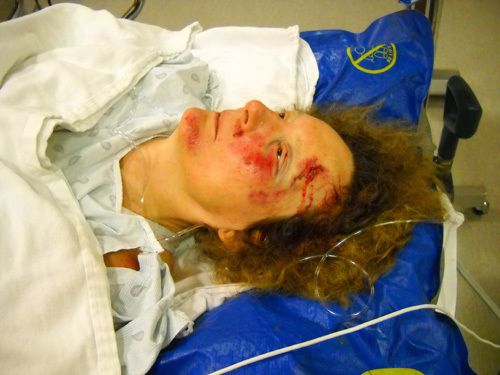 In the next three entries I'll go into more details about my injuries, their seeming inconsistencies, things that I did right and wrong when I went out for my bike ride, collateral damage to the bike, helmet, glasses, etc., puzzling aspects of the crash, and much more. I'll even let you see inside my brain! Think about that one.